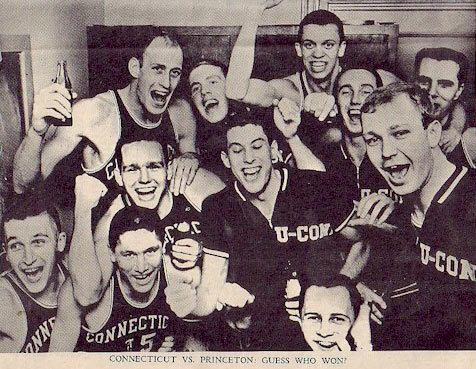 Al Ritter was a Guard for the UConn Huskies from 1960 – 1964. Al and his brother Ron both played basketball for the University of Connecticut between 1960 – 1967. I spoke with Al in April 2005, about his basketball experiences, and his post-collegiate experiences. Al and his high school teammate Billy Della Sala were the “big fish” on the team. They both averaged 20 points a game, both made All County and All State teams, and both went on to play at UConn. Al remembered while in high school his team went to the final of the county tournament a couple of years but never won the championship. In the state tournament they won several games but never won the state championship. Al was offered scholarships to play at the college level; the University of Virginia, Bucknell University, Rutgers University, and UConn were among them, but Al refused the offers, making plans to go to the Naval Academy. He encountered an unforeseen situation. He didn’t get accepted into the Academy. Upon receiving this news, Al’s first call was to Coach Hugh Greer at UConn, where Al had been offered a scholarship. Al felt that UConn had a good academic reputation, it was a good distance from home (New Jersey), and it had a Division I basketball program, and when you think you’re good, you want to go to a Division I program. When Al called Coach Greer, Al said, “I’d like to accept your scholarship offer.” Hugh Greer responded, “Sorry Al, we gave your scholarship away.” A few hours later Coach Greer called Al back, and told Al he was able to come up with scholarship. Al told me during those few hours he wanted to go to UConn even more, when he thought he wasn’t going to be able to. Through the three-day seminar, Al was so inspired that he soon began working for the consulting group Dibianca Beckman Group, Felington, New Jersey for the next five years. Next Al worked for Accenture Consulting, Chicago Illinois for five years. When 9/11 happened, consulting companies suffered, and Al had to look for a new job. He started his own consulting firm, Ritter Consulting Group, four years ago where he is the president with five people working for him, and their consulting work is throughout the country as he continues to help companies produce winning teams and results. Al has been married to his wife, Barbara, a clinical psychologist for 33 years. They have two daughters, Ashley age 24, and Andrea age 21. Ashley has Down Syndrome. Al and Barbara took care of Ashley for many years, and currently Ashley is living at Mount Saint Joseph’s, a Catholic Church sponsored residence for women with disabilities where she can be with people her own age. “She goes to a workshop every day where she puts parts together for a company. Last year she made $248 and she’s proud of it!” her father said. Andrea is a junior at Hope College in Holland, Michigan. Andrea played sports until she was a junior in high school when she decided sports weren’t her thing. Al still loves sports, particularly basketball and baseball. He has exposed his wife and daughters to sports but they don’t maintain the same interest level as he. Al ended our conversation by telling me through his experiences on the UConn basketball teams he learned to pay attention to fundamentals. “I think that any activity that’s worthwhile in life, you really have to pay attention to the small stuff, the fundamentals like catching the ball with two hands, and playing good solid defense even though nobody can see whether you are or not.” In addition to that, Al said it’s important to care about the success of your teammates as much as yourself.